The Lok Sabha constituency Chennai South is one of three constituencies in Tamil Nadu. It was formerly known as Madras South. It was created in 1957 through bifurcation of Madras Lok Sabha constituency. The constituency number of the Chennai South constituency is 3 and is not reserved for any category (General Category). This is the most populous Lok sabha constituency in the southern state. Lok Sabha Elections 2019 Schedule: Voting In 7 Phases From April 11 to May 19, Counting And Results On May 23; Check All Dates For General Elections. C. N. Annadurai, the first non-Congress chief minister of Tamil Nadu resigned his seat in 1967 after he was nominated for chief ministership. It was later contested and won by Murasoli Maran. In the upcoming 2019 Lok Sabha Elections, the AIADMK has fielded Dr. J. Jayavardhan from the Chennai South Lok Sabha Constituency while the DMK has fielded Tamizhachi Thangapandian. 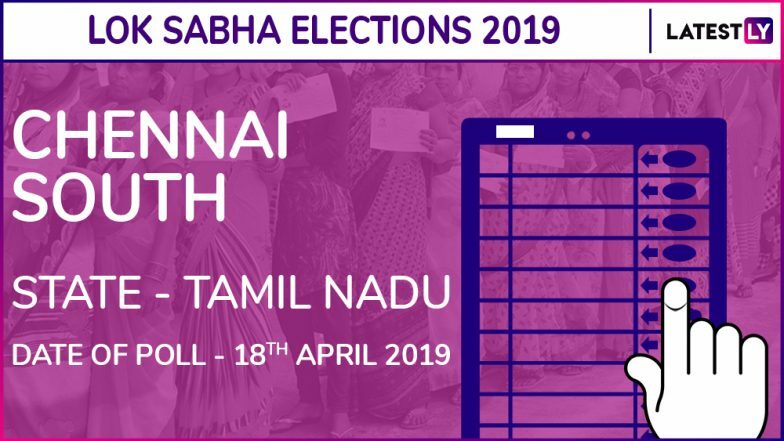 Tamil Nadu Lok Sabha Elections 2019 Dates: Constituency-Wise Complete Schedule Of Voting And Results For General Elections. All the 39 parliamentary constituencies in Tamil Nadu will vote in the second phase on April 18. The results will be declared on May 23. Out of the 39 Lok Sabha seats in Tamil Nadu, the BJP to contest 5 seats while the AIADMK is contesting on 27 seats. In 2014, AIADMK's Dr. J. Jayavardhan had defeated DMK candidate T. K. S. Elangovan from the Chennai South Lok Sabha Constituency. Jayavardhan had won with 4,34,540 votes accounting to 40.03 percent of the total vote percentage.